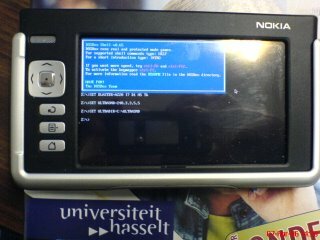 As I am experimenting with videoplayback on the Nokia 770, I had a look at both GTK+ and SDL for this purpose. After a quick hello-world style SDL application, I decided to get something cute running on the device. I had a quick look at the Maemo Application Wishlist, and saw DosBox. This looked interesting to me, so I had a quick go at getting it up and running on the device. It compiled just fine in Scratchbox. Several issues showed up. The first being related to SDL screen initialisation: you should always init SDL in 800x480 16 bits per pixel mode, fullscreen, with hardware accelerated SDL surfaces. Second issue was exactly the same as with Google LibJingle: it quickly ran out of memory and got killed by the kernel. Skimming through the sourcecode, followed by a quick hack fixed the first issue, while a swapfile fixed the second (16M swap appears to be enough). Furthermore, DosBox seems to use the Alsa sequencer for MIDI support, that doesn't seem to work either, as there appears to be no sequencer. I haven't looked into this. The binary is available here. The patch , horrible as it is -remember, it was a quick 2 min hack with grep and sed- is available here: Dosbox ugly N770 patch. It is truly a stupid patch, but as I'm distributing the binary, the GPL requires the availability of the code. Hey dude. That looks sweet. Do you happen to still have that patch? The link is broken.